How many times have you said to yourself, “This could use a cup holder.”? Whether it’s a riding lawnmower, your newborn’s crib, or your roadside mailbox, there’s very few things that wouldn’t benefit from the functionality and practicality of a cup holder. That’s where the CupHolder+ comes in. Molded with the finest of plastics from a 7th generation cup-holder-smith, the CupHolder+ is a game changer in the cup holder industry. Why? 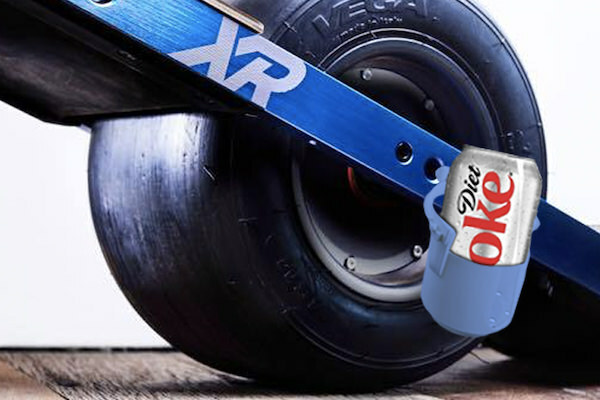 Because it attaches directly to your OneWheel’s rail and uses the board’s self-balancing technology to keep your drink stable and unspilled! In the video below, you’ll see a famous clip of Bart Miller nosediving. Many believe this was because he leaned too far forward in order to gain speed and impress the people recording him from their car. However, if you look closely, you’ll notice the beer bottle in his left hand. Just before he nosedives, the liquid in the bottle shifted, causing him to loose stability, resulting in him eating the pavement. With the CupHolder+, his beer would have remained perfectly level and this would have never happened.